Implants - Warren Libman D.D.S. Luda was missing several teeth and the remaining teeth were very broken, worn down, painful, and out of position. 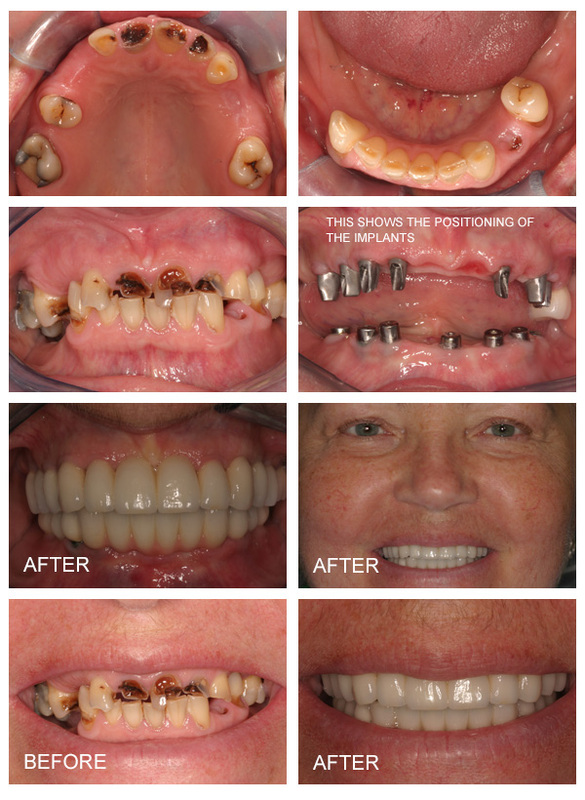 Most were extracted and replaced with strategically positioned implants, so that we were able to build her a whole new dental reconstruction. She was thrilled with how well she is now able to function, not to mention how much she likes smiling now! It was worth her trips back and forth from the Ukraine to go through this process! Eric accidentally took an elbow to the mouth and badly broke off his front tooth. Unfortunately it had to be extracted, but luckily nowadays it’s easy to immediately replace the tooth with an implant. Then a custom Zirconium abutment can be made, and restored with a ceramic crown. Once we were done it was hard to tell that there was ever a problem! Lauren had a beautiful dentition but was congenitally missing a lateral incisor. This is a perfect situation to replace a tooth with an implant­-supported crown. Dwight developed an “Ameloblastoma”, which is a rare cancerous­-type lesion of the jawbone. He had to have a large section of his lower jaw resected along with the corresponding teeth. Using three implants we were able to fabricate a bridge that not only replaced the five missing teeth but also mimicked the lost gum tissue, enabling us to give Dwight back his intact dentition. We felt that Mark’s missing bicuspid presented a perfect situation for a single tooth implant, shown here after several years of service. We replaced Tim’s missing molar and bicuspid with two single tooth implants. This allowed us to avoid involving his adjacent natural teeth. Wally’s remaining teeth were ravaged by his high susceptibility to decay. He wasn’t interested in dentures so we replaced all his teeth with implants and fixed bridgework. Five years later he still has a big smile on his face and is so happy he chose this treatment approach. Being a passenger in an automobile accident is not only unlucky but was also horribly traumatic for this young lady. Along with other injuries she lost her teeth as well as the bone that was supporting her front teeth. Her jawbone was reconstructed with grafts, and we managed to get in enough implants to support ceramic fixed bridges. Note that we had to use pink porcelain to replace the lost gum tissues, but Laura was thrilled that she finally had her beautiful smile back. Rebecca was missing her lateral incisor and also didn’t like the discoloration of her other teeth. Her treatment involved micro abrasion and bleaching of her teeth and placement of a single tooth implant to replace the lateral.